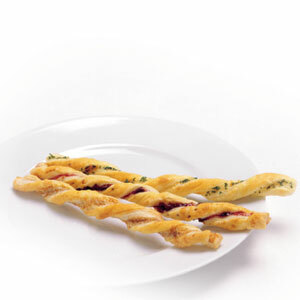 These pastry twists are easy to make- simply roll out some prepared puff pastry, top with a delicious cheese mixture, twist and bake! Heat the oven to 400°F. Beat the egg and water in a small bowl with a fork. Lightly grease a baking sheet. Stir the cheese, parsley and oregano in a small bowl. Sprinkle the work surface with the flour. Unfold the pastry on the work surface. Roll the pastry into a 14 x 10-inch rectangle. Cut the rectangle in half lengthwise. Brush the halves with the egg mixture. Top 1 half with cheese mixture. Place the remaining half over the cheese mixture, egg-side down. Roll gently with a rolling pin to seal. Cut the pastry crosswise into 28 (1/2-inch) strips. Twist the strips and place them 2 inches apart on the baking sheet, pressing down the ends. Brush the pastries with the egg mixture. Bake for 10 minutes or until the pastries are golden brown. Let the pastries cool on the baking sheet on a wire rack for 10 minutes. For Choco-Berry: Omit the cheese, parsley and oregano. Spread the pastry half with 2 tablespoons seedless raspberry jam and sprinkle with 1/3 cup mini semi-sweet chocolate pieces. For Cinnamon-Sugar: Omit cheese, parsley and oregano. Stir 2 tablespoons sugar and 1 teaspoon ground cinnamon in a small bowl and sprinkle on pastry half as directed in Step 3.